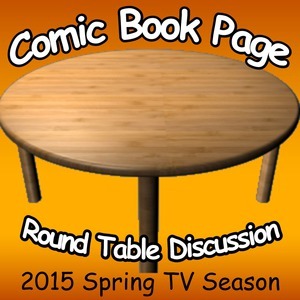 John Mayo, of ComicBookPage, and Kay Kellam, of PopArtsPlace, discuss the 2015 spring fall television season. The short version — the primary focus of this podcast is on the new shows starting up in the spring on “major” networks and cable channels. The shows are in order they are expected to premiere. With a strong 2014 fall season having resulted in few cancelled shows, the mid-season offerings feel like fewer than expected, for instance iZombie does not yet have a premiere date that we could find. Keeping that in mind, we covered as many of the December through May offerings we found of interest, and had available to us when we sat down to discuss the upcoming premieres and returning shows: The Librarians, Galavant, Agent Carter, Empire, Hindsight, Expedition Unknown, Melissa & Joey, Switched At Birth, 12 Monkeys, Musketeers, Chasing Life, The Fosters, Justified, Backstrom, Suits, Allegiance, Perception, Rizzoli & Isles, Odd Couple, Vikings, Battle Creek, Secrets and Lies, CSI Cyber, DIG, The Royals, AD, Orphan Black, and Wayward Pines. The episode includes shows from ABC, CBS, CW, FOX, and NBC, as well as ABC Family, History, SyFy, TNT, Travel Channel, USA and VH1. During the discussion of upcoming mid-season replacements, returning shows, and event series, we also discussed the available trailers, and commercials and how effectively some sold their shows, while others left us needing to find more information. After recording the episode Kay Kellam discovered PIVOT is moving into scripted programming with Fortitude, just one of many examples of the shows that unfortunately did not make it onto our radar, and the list in time to be included. This entry was posted in Podcast, Podcasts, Television and tagged 12 Monkeys, ABC, ABC Family, AD, Agent Carter, Allegiance, Angie Harmon, Aramis, Athos, Backstrom, Battle Creek, Boyd Crowder, Bruce McGill, CBS, Chasing Life, Christian Kane, ComicBookPage, CSI Cyber, CW, D'Artagnan, Dean Winters, Dennis Haysbert, DIG, Elizabeth Hurley, Elmore Leonard, Empire, Eric McCormack, Expedition Unknown, Fortitude, FOX, Gabriel Macht, Galavant, Gina Torres, Hindsight, History, Italia Ricci, Jason Isaacs, Joey Lawrence, John Kim, John Mayo, John Stamos, Jordan Bridges, Josh Duhamel, Josh Gates, Justified, Lee Thompson Young, Levar Burton, Lydia Rose Bewley, Matthew Perry, Melissa & Joey, Melissa and Joey, Melissa Joan Hart, Musketeers, NBC, Orphan Black, Patricia Arquette, Patrick J. Adams, perception, Pivot, Porthos, Rainn Wilson, Raylan, Raylan Givens, Rebecca Romijn, Reed Diamond, Rick Hoffman, Rizzoli & Isles, Robbie Amell, Sasha Alexander, Secrets and Lies, Suits, Switched At Birth, SyFy, Taraji P. Henson, Tatiana Maslany, Terrence Howard, The Flash, The Fosters, The Librarians, The Odd Couple, The Royals, Thomas Lennon, Timbaland, Timothy Olyphant, Timothy Omundson, TNT, Travel Channel, USA, VH1, Vikings, Vincent Regan, Walton Goggins, Wayward Pines, William Moseley on January 9, 2015 by Kay.